Welcome to our friendly practice, where we provide state-of-the-art treatment for gum disease and placement of dental implants. Welcome to Pittsburgh Dental Implants and Periodontics, known as one of the most progressive dental practices in the Tri-State area. It is commonly mentioned by our patients that our practice is “the best healthcare environment” they have ever experienced. Our practice has been a leader in providing continuing education to dental professionals of the greater Pittsburgh area for over 33 years. We are also nationally recognized leaders in providing preventative treatment for gum disease. Wherever possible, we use non-surgical and minimally invasive methods of treatment. Even the most severe gum disease can be treated with our non-surgical periodontal procedure using the Perioscope. With our 3D X-ray system, we can plan dental implant treatment ahead of time, making it a minimally invasive and efficient procedure. As periodontists, Dr. Weingarden and Dr. Bakuri have received specialist training in placing dental implants, and both train other dentists in this procedure. Together, they have provided thousands of patients with the life-changing solution of dental implants to replace missing teeth. We routinely see happy patients that are still able to comfortably eat and smile because of implants placed in our office over two decades ago. You will always be treated with friendliness, respect and care during your dental visits. Dr. Weingarden and Dr. Bakuri and our staff of well-trained and efficient professionals treat each patient with warmth and respect. We are here to help you achieve your goal of better oral health and we’ll work with you as a team. You will be in a friendly and relaxing environment where you can get the high-quality dental care that you need and deserve. 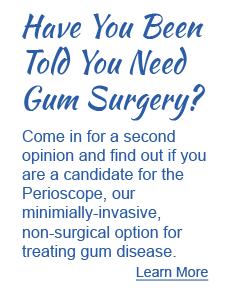 Our doctors use the high-tech, minimally invasive Periscope to treat moderate to severe gum disease without surgery. We have equipped our practice with the latest in dental technology to provide you with efficient, effective and comfortable treatment. In nearly all cases of moderate to severe gum disease, gum surgery can be avoided by treatment with the non-invasive perioscopic procedure. We can achieve excellent results, even in difficult cases, without potentially painful cutting or suturing. By capturing highly detailed, three-dimensional images with our CT cone beam scanner, we can find the best areas of jawbone for placing dental implants, without the need for exploratory surgery. This means shorter healing times and much less discomfort. 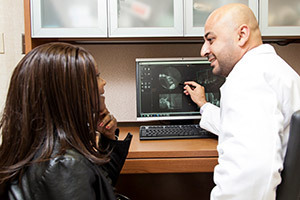 Our doctors also employ the latest state-of-the-art techniques and procedures when grafting bone and/or gum. We like to get to know you; we listen carefully and answer any questions you may have. It’s important to Dr. Weingarden and Dr. Bakuri to get to know you and understand what your expectations are for your dental and overall health. They will listen carefully to any concerns you may have, answer all your questions and explain the procedures so that you fully understand and are comfortable about receiving them. As well as our attentive service in the practice, you will also receive a follow-up call to check on your progress after any procedure. We have a great team who get along well together and who will always give you a warm welcome and friendly and efficient service. We don’t believe that our patients should be in pain. Pain means there is a problem that needs to be uncovered and treated. We work to eliminate the cause of any pain you may be experiencing and provide you with medication to ease your discomfort. We also offer oral and IV sedation during longer procedures or for patients who are experiencing anxiety. Your comfort is always a top priority for our entire team. In our practice, we are never accepting of the status quo or the perceived limitations of current dentistry when seeking to accomplish our treatment goals. We have a long track record of being in the forefront of technology, embracing advanced procedures and updating our abilities. We are continually in search of methods to improve the quality of dentistry we offer our patients, even if that means to simply find more cost effective methods to provide treatment. For example, Dr. Weingarden designed software two decades ago to automate periodontal record keeping, saving time and resources while also implementing a unique process to monitor patient progress. We have been nationally recognized as leaders in providing preventative dental care for over two decades. This recognition leads to many referrals from general dentists who send patients to us for our advanced, non-surgical treatment of gum disease. We also see many patients who have travelled outside their community to seek treatment with our practice. We take several approaches to preventative care: caring for our patients, coaching our patients and teaching other dental professionals. This helps to achieve lasting results that translates to better oral and overall health, and can save you money! We use the state-of-the-art Periscope to provide deep cleanings for gum disease. Routine examinations and professional cleanings are vital to the prevention of gum disease. We also monitor your overall oral health, such as the depth of the pockets between your teeth and gums, and chart this data with our Patient Progress software. The program efficiently sorts the information and helps us assess your continued progress or any potential problems. We take the time to coach our patients, offering advice on methods for maintaining good oral health that is customized to your specific needs. Dr. Weingarden and Dr. Bakuri also provide training to other dental professionals. Dr. Bakuri is on the faculty of Allegheny General Hospital, where he teaches dental residents about periodontics and dental implants. Dr. Weingarden has taught courses on diagnosing and treating periodontal diseases, intercepting inflammatory disease, when and how to treat gum recession and the treatment of peri-implantitis. Additionally, Dr. Weingarden has taught courses on dental occlusion to graduate dentists at the University of Philadelphia. Occlusion is the manner in which the upper and lower teeth come together when the mouth is closed, the “bite.” Understanding, and sometimes correcting, this relationship between the teeth is vital to achieving oral health as trauma caused by a misaligned bite can lead to bone loss around the teeth or loosening of the teeth.